If you’ve watched the world news or read a bit online, you’ve probably seen something about the riots in Kyrgyzstan, a former USSR republic that borders China and just tried to oust its president. 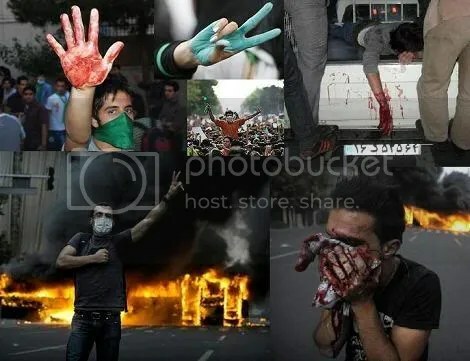 Protesting masses took to the streets demanding a change in government, the president fled, hundreds of police were summoned to quell the riots, and many people were hurt and killed. President Kurmanbek Bakiev maintains he is still in power. An interim government spawned by the riots and headed by Roza Otunbayeva also claims leadership and openly seeks Bakiev’s resignation. So, you’re up to speed on the basics. Now for the nitty gritty. This is all about corruption and political malfeasance. A head of government makes some questionable appointments, arrests some influential people, utilty prices skyrocket, a populace feels cheated, and suddenly dozens of people are dead and hundreds are wounded. It’s an old story, but one we seemingly never learn from. I’ve done little research on the heart of the matter (this article seems a good place to start if you want to) but I did catch a Nightline spot which mentioned police firing into a crowd of protestors. Which is really why I’m posting about it. Because I find that disgusting. I don’t really care what the government and or President Bakiev did. Yes, it was probably dirty, and almost certainly unfair to the Kyrgyz people … because that’s what governments are good at. But to allow, and even encourage, armed enforcers to use live ammunition on an unarmed population is inexcusable. And I’m not talking handguns, or sharpshooters taking out the small number of protestors armed with weapons taken from other guards/police/etc. Witnesses describe them as automatic sub-machine guns, and video clips show them firing full-tilt in the direction of protestors. A government that will permit such an excessive use of force on its people cannot be endorsed with any moral conscience whatsoever. With various non-lethal choices available, there is no reasonable explanation for such an action. An ABC News article reports that initial protests in the capitol city of Bishkek were met with just that sort of non-lethal force: rubber bullets, tear gas, water cannons, concussion grenades. But the attempts to break up the crowds were not focused and angry protestors fought back with rocks, sticks, and sheer numbers. They overpowered some policemen and took their weapons, even their vehicles at times. When they congregated at the government headquarters known as the White House (no, that’s not a typo), things turned ugly. The ABC article does not discuss why the police didn’t concentrate their efforts on the White House to begin with. It seems logical to me, especially with a demonstration in the western city of Talas the day before where protestors entered a government building and took control, purportedly holding a governor hostage. With a clear voice, the opposition was calling for the president’s resignation, so it’s a pretty good bet that sooner or later the protests would center on the White House. It would not be difficult to encircle the building with police and keep non-lethal weaponry at the ready. Whatever the reasoning, police forces were scattered ineffectually around the city as protests became riotous and protestors grew violent. An armored vehicle, seized by protestors, threatened to ram the gates of the White House. Six men in the crowd reportedly fired shots into the air as the people decried the government. Then a group of police opened fire on the crowd. It wasn’t clear if these police were stationed at the government building or pushing into the protestors from another direction, and to the dozens killed I doubt it matters. It also wasn’t clear why no effort was made to disperse the crowd using non-lethal means. That group of police purportedly numbered 200, were classified as “elite,” and yet never sent so much as a single canister of tear gas into the protestors before they “began firing, pushing the crowd back.” In retaliation and further protest, a government office was set on fire and several others damaged. Protests and demonstrations in other cities deposed local heads of government. Media outlets were overtaken to spread the word of protest and opposition. And so the president fled. An interim governing body was assembled. Protestors calmed and divided. And the country – the world – waits for resolution. I applaud the Kyrgyzstani people in standing up to what they believe is an unjust and corrupt government. I admire their determination and resolute push to see change. I hope the resolution is fair and sets the nation on a road with less upheaval and more freedom and justice. And I hope the United States stays out of it. You may have heard about the plight of a small delta town called Jericho and its assistant fire chief Don Payne. It’s had a few mentions on the news networks and a couple appearances on the AP feed … and I dedicated a post to the story a couple weeks back (Holy Jericho). For a quick re-cap of events: while in a court hearing over a traffic ticket issued to his son, Don Payne and at least one member of the Jericho Police Department got in an argument stemming from illegal traffic tickets issued to Payne and other residents of Jericho. A scuffle ensued and Payne was shot in the hip by Officer Eric Pharr of the Jericho Police Department. He was hospitalized in Memphis and underwent a five-hour surgery to remove the .40 caliber bullet which had lodged in his hip bone. He was recently released in good health but still requires the use crutches. Following the shooting, Jericho Police Chief Willie Frazier temporarily disbanded the police force and the entire department remains under investigation. But no charges have been filed against Officer Eric Pharr, who fired on an unarmed Don Payne in front of six other police officers and presiding judge Tonya Alexander (who quickly resigned her post). The Crittenden County Sheriff’s Office, which began investigating other questionable Jericho police acts, has reported no progress in the investigation and has shared little of the information collected about the courtroom incident. Unfortunately, a gunshot wound was only the beginning for Mr. Payne. Days after being released from the hospital, Jericho Mayor Helen Adams officially dismissed him as assistant fire chief. “As it comes to my attention of the improper behavior that you displayed,” she wrote in his letter of termination. “You have disgrace my name as Mayor.” And to top it off, arrest warrants were issued for his arrest. Let me repeat that: the police issued warrants for the arrest of Don Payne after he was shot by a police officer during court proceedings about the legality of the police department’s actions. The decision not to prosecute Officer Pharr apparently fell to West Memphis City Prosecutor Lindsey Fairley, who supported the officers’ right to detain the former assistant fire chief. Apparently by whatever means necessary. It was also Fairley who decided to levy the charges on Don Payne. The charges – two counts of felony battery – allege that Payne assaulted Police Chief Willie Frazier by shoving him backward, and then reached for Officer Eric Pharr’s weapon. Which Payne vehemently denies. Thomas Martin, the chief investigator for the Crittenden County Sheriff’s Department heading up the on-going investigation of Jericho’s police force, confirmed not only that the warrants had been issued but that the police claimed Don Payne was reaching for Eric Pharr’s weapon when he was shot. Early reports noted that the bullet struck Don Payne from behind, which was corroborated in the wound as seen in this video (at the :30 mark). But that angle of approach would make reaching for the pistol improbable if not impossible, a particular of the case that no one in authority has yet commented on. Randy Fishman, of the Memphis law firm Ballin Ballin and Fishman, was secured as Don Payne’s legal counsel shortly after the shooting and maintains that the police were not acting in the public’s best interest. “I think an officer should be trained in not only how a weapon should be used but when a weapon should be used,” Mr. Fishman said. He reiterated that pulling a pistol on an unarmed civilian surrounded by police showed poor judgement, and that firing it was negligent at best. “If anyone should be charged with a felony here, it should start with the officer who pulled the gun.” He has also stated that they are prepared to fight any charges arising from this unfortunate circumstance. And though he is no longer Jericho’s assistant fire chief, the rest of the Volunteer Fire Department fully support him. All 19 members quit the department en masse on hearing of Payne’s dismissal. On September 9th, the mayor and city council had a “secret meeting” but none will speak to the press about that meeting, the incident, or even the original allegations of police corruption in Jericho. Various reporters have attempted to speak with city officials but met stiff opposition, including a police response. With a bit of digging, I unearthed the phone number of Jericho City Hall and repeatedly rang it myself … to no avail. The same was true of the Crittenden County Sheriff’s Office. (I hate to think if I lived in the county and tried to ring their offices with an actual problem.) But I take this as a good sign. Because if they aren’t talking, it means they are concerned, and if they are concerned then – just maybe – they have something be concerned about. I intend to follow this case and update on it when news becomes available. And in the meantime, godspeed to Mr. Payne and Mr. Fishman. In the flatland of Arkansas’s Mississippi delta rests a small town named Jericho. Just off the interstate and home to less than 200 people, motorists generally pass it by on I-55 without a moment’s notice. Unless you’re driving through town, that is. “You can’t even buy a loaf of bread, but we’ve got seven police officers,” said former resident Larry Harris. Some news broadcasts confirm only six but at either count, those police officers were well-known for their propensity to write tickets, to such an extent that many locals and passers-through called the town a blatant speed trap. Among other infringements, officers also routinely wrote tickets while well out of their jurisdiction and for actions which are not illegal. Larry Harris, quoted above, moved away from Jericho to escape law enforcement’s heavy hand there. Another resident stayed in Jericho but agreed that the police were prolific ticketers. “They wrote me a ticket for going 58 mph in my driveway,” said Albert Beebe, a 75-year-old retiree. On August 27, the issue came to a head. Local Volunteer Fire Chief Don Payne was issued a traffic ticket and disputed it in court but failed to get it dismissed. He was ticketed again later that day and returned to court to dispute it. This time he let his unvarnished opinions fly in front of the judge and the attending police officers. At some point, it developed into an argument between Volunteer Fire Chief Don Payne and the police, all of whom attended the proceedings. The argument then turned into a scuffle and Payne was shot. That’s right, in the middle of a court in session, in full view of the presiding judge, a Jericho police officer drew a pistol and fired on the unarmed fire chief. The bullet grazed another officer and struck Don Payne in the hip. He was transported to the Memphis Regional Medical Center and is currently in good condition. Presiding judge Tonya Alexander voided all outstanding tickets issued by the Jericho police force for the month prior and, following the incident, resigned from her position. Police Chief Willie Frazier disbanded the force for the time being and the Crittenden County Sheriff’s Office took over policing duties in the area. The identity of the officer who shot Volunteer Fire Chief Don Payne has not been released and Payne is not speaking out on the issue. No charges have been filed against anyone, but Police Chief Willie Frazier and the former police department are now under investigation. And not just for the shooting. It seems Jericho police had a funding problem. Despite writing unusually high numbers of tickets, which should have generated a lot of income for the town, one of the Jericho cruisers and one of its fire trucks were repossessed. (I have a feeling the loss of that fire truck may have had something to do with the fire chief’s growing displeasure with the police force.) To date, the police have issued no statements and provided no records indicating where the funds may have gone, not even to the sheriff’s office and investigators. Allegations point toward officers pocketing the money themselves. Police Chief Willie Frazier is also said to have used town vehicles for personal use, including repeatedly driving his squad car on 140-mile round-trip excursions to Atoka, Tennessee. The investigation is just getting started. I believe, in Jericho, walls are about to come down. You can read more in the AP article or listen to short reports from the regional news station here. I tagged this as humorous – which it is – but at the same time I am completely disgusted by this reviling excuse for a police department. How many years have they defrauded the public? How many thousands have they illegally collected? And I cannot believe this whole set-up did not raise some eyebrows at county level long before now. Why wasn’t someone with authority asking questions? Just how many towns with a population under 200 can afford half a dozen police? One town I live near has a population of over 400, contains several businesses, and can afford two. That impossible people-to-police ratio must have attracted attention. The Crittenden County Sheriff’s Office was very familiar with Jericho police, just eight miles away, and it was even reported that Jericho police often left their cruisers at the Sheriff’s Office overnight to avoid vandals. This wasn’t a podunk outpost in a far corner of the county; this was just off the interstate, eight miles down the road, and the officers drove right into the sheriff’s parking lot. As in most cases, I’d say the corruption surfacing in Jericho is just part of a larger tangle of malfeasance. The real questions, I suppose, is how far the tangle reaches, what all it ensnares, and how many other towns – all across the country – live with one eerily like it on their own streets.